En español | Imagine fighting cancer with a vaccine. Or treating depression with a magnet. Or even growing a new liver or bladder using cells from your existing organs. Many of these novel approaches, for treating heart disease, cancer, and even blindness, are already in place or coming soon. Of course, as with any new procedure or medication, there may be as-yet-unreported side effects. And not all new technologies are covered by insurance. These innovations, however, could potentially save your life — or the life of someone you love. Doctors are making amazing medical discoveries that could change your life. Remember The Six Million Dollar Man? Steve Austin had a bionic eye, which was almost as impressive as the Argus II, an artificial retina for people blinded by degenerative diseases like retinitis pigmentosa, an inherited retinal condition that affects some 100,000 people in the United States. 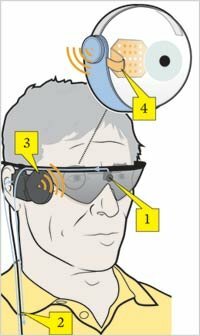 Here's how it works: A tiny video camera mounted on a patient's glasses transmits signals to an implant on his or her retina; the implant then sends pulses to the brain, which are perceived as images. 1. A tiny video camera in the patient's glasses captures a scene. 2. The video is sent via cable to a mini- computer, where it is transformed into instructions that are sent back to the glasses. 3. The instructions are sent to an implant over the patient's damaged retina. 4. The implant emits signals, which the brain interprets as images. About 30 patients have received artificial retinas so far, and the technology continues to improve. While the first model allowed people only to locate objects and identify the direction of movement in front of them, the latest version has enabled patients to read high-contrast letters and string together words, says researcher Ashish Ahuja, Ph.D., a consultant to Second Sight, the Sylmar, California – based company that manufactures the Argus II. The next big goal is to adapt the technology for patients with macular degeneration, a major cause of vision loss, afflicting 1.75 million Americans. For heart patients, doctors have long wanted an alternative to the blood-thinning drug warfarin, which is notoriously difficult to regulate and has many food and drug interactions. Now they've got one: Pradaxa, which was cleared by the FDA last fall and is currently on the market. Like warfarin, Pradaxa decreases the risk of stroke in patients with atrial fibrillation, a common type of heart-rhythm abnormality in older adults. Warfarin works by blocking vitamin K, which helps make some of the blood's key clotting factors. Pradaxa works further down the clotting chain, blocking thrombin, the immediate precursor to a blood clot. Studies show that Pradaxa is 35 percent better than warfarin in reducing the risk of stroke. Plus, it doesn't require patients to undergo periodic lab tests, and has no food and few drug interactions. At least two other new blood thinners are expected to hit the market in the next two or three years as well. "We've been looking for a new anticoagulant for 50 years," says Alfred Bove, M.D., Ph.D., professor emeritus of medicine at Temple University in Philadelphia and past president of the American College of Cardiology. "Now it looks like we might have several." For folks who can't pull out of depression with the help of psychotherapy and medication, and who want to avoid the seizures and memory loss associated with electroconvulsive therapy, transcranial magnetic stimulation (TMS) is shaping up to be a less drastic blues buster. 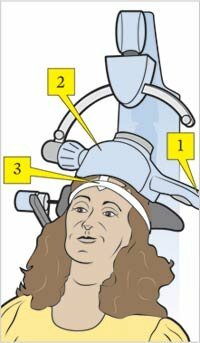 Cleared in 2008 for the treatment of major depression, the therapy uses a small electromagnet, which is placed on the scalp right behind the left forehead, and delivers a tiny electric current to the part of the brain linked to depression. 1. A computer sends electrical currents to a treatment coil placed around the patient's head. 2. The treatment coil converts those electrical currents into an MRI-strength magnetic field. 3. The magnetic field stimulates neurons in the part of the brain — the prefrontal cortex — linked to depression. It seems to work, though researchers aren't certain how or why: A 2008 study in the Archives of General Psychiatry shows the therapy is almost three times more effective than a placebo in easing depression. And beyond tingling or slight pain in the scalp, the therapy has no serious side effects. The FDA-approved treatment is currently available in about 300 psychiatrists' offices around the country, and it's covered by a growing number of insurance companies. Magnet therapy appears particularly helpful for older adults, according to researcher Mark George, M.D., a psychiatrist and neurologist at the Medical University of South Carolina in Charleston. That's because many older patients are sensitive to side effects from medication, and electroconvulsive therapy is not an option for frailer patients. Vaccines have been arming children's immune systems against diseases ranging from chicken pox to polio for decades. Today researchers are using the same technology to fight prostate cancer, with a new vaccine known as Provenge. Doctors remove some of the patient's white blood cells, expose them to a protein found in prostate cancer, and then inject the cells back into the body, where they prime the immune system to attack the cancer. "Harnessing the body's immune system opens the door to a whole new kind of treatment for people with other kinds of cancer," says lead investigator Philip Kantoff, M.D., the chief clinical research officer at the Dana-Farber Cancer Institute in Boston and a professor of medicine at Harvard Medical School. Although Provenge does not cure prostate cancer, the vaccine reduced patients' overall risk of death by 24 percent in a three-year period in a recent multisite study. Reported side effects — chills, fever, headache, joint aches, and back pain — usually disappeared after a few days. The drug was approved last year for patients with prostate cancers that have metastasized and have stopped responding to hormone treatments. Shipping a heart for transplant is a little like packing beer for a road trip: Doctors pack the heart on ice in an ordinary picnic cooler — just as they've done for decades — before shipping it across town or across the country. But the heart typically doesn't work as well when it's finally transplanted in a new patient, in part because the heart's function declines when it's not pumping blood. Explains Abbas Ardehali, M.D., chair of cardiothoracic transplantation at the UCLA School of Medicine: "Our organs are not meant to be on ice." Ardehali is leading part of a large, multicenter study of a revolutionary new technology that keeps a heart beating while it's transported from donor to recipient. Called the warm blood perfusion system, it involves putting the heart on a small heart-lung machine and supplying it with the donor's blood and a nutrient-enriched solution at normal body temperature. This keeps the heart healthy and lengthens the time frame in which it can be used. In Europe, where the process has been approved and used in about 120 patients, hearts have been kept beating for more than 8 hours before transplantation, practically doubling the time an organ can be viable. "The technology could allow organs to travel greater distances and allow us to expand the potential donor pool, making more hearts available for transplant," Ardehali says. Phase II trials are now under way, with plans to enroll 128 patients by the end of 2012. If final results are positive, the new system will take the next critical step toward FDA approval — larger phase III trials — and could debut in several years. Think stem cells and you probably think of the controversial embryonic variety. But autologous "adult" stem cells — those derived from a patient's own body — promise to revolutionize the treatment of some cardiac conditions, minus the tricky ethical issues. These cells are taken from a patient's bone marrow, multiplied in a lab, and injected back into the patient's bloodstream or directly into damaged heart muscle. Stem cells could be a godsend for patients with peripheral artery disease (PAD), a severe form of vascular disease, often affecting the legs, that afflicts about 8 million Americans, 90 percent of whom are over 50. In severe cases the blood vessels of PAD patients may become so clogged that major surgery or even amputation is required. "If you get a diagnosis of PAD, your life expectancy is worse than for many types of cancer," says researcher William Marston, M.D., chief of vascular surgery at the University of North Carolina School of Medicine in Chapel Hill. Early studies suggest that stem cell treatments may reduce the number of amputations and help wounds heal, possibly by helping generate a new network of healthy blood vessels to resupply the limbs. "We think stem cells may serve a number of functions — reduce inflammation, recruit other cells to carry out repairs, and even transform into the actual cells that populate new capillaries," Marston says. The treatment is beginning phase III trials — the final phase before FDA approval. But researchers will need time to collect and analyze the data. "If the results continue to be positive and there are no safety issues, we would hope for approval in the next three to five years," Marston says. They're like smart bombs for fighting breast cancer: new medications that attack cancer cells while leaving healthy cells relatively unscathed. They're called PARP inhibitors, and they target an enzyme that helps cancer cells repair themselves after chemotherapy. "These drugs represent an entirely new way of treating breast cancer." —Nicholas Turner, M.D. "These drugs represent an entirely new way of treating breast cancer," says Nicholas Turner, M.D., senior lecturer and honorary consultant at Britain's Institute of Cancer Research. Early studies suggest that PARP inhibitors can effectively fight triple-negative breast cancer, responsible for around 15 percent of breast cancer cases. Tumors of these cancers lack receptors for estrogen, progesterone, or HER-2, characteristics that current medications target. Data from Baylor Sammons Cancer Center in Dallas showed that patients who got the PARP inhibitor iniparib along with chemotherapy had a 52 percent response rate, compared with 32 percent among those who received chemotherapy alone. A British study found that another PARP inhibitor, called olaparib, shrank or stabilized tumors in 12 of 19 patients whose cancers stemmed from mutations in the inherited BRCA-1 and -2 genes — and who had not responded to other treatments. The data were so astonishing that the results were published in 2009 by The New England Journal of Medicine, which rarely publishes the results of phase 1 drug trials. In a study published last year in the medical journal The Lancet, researchers reported that olaparib shrank tumors in 41 percent of patients with these inherited cancers. Olaparib is also being studied for treating other cancers that spring from such mutations, including some types of ovarian and prostate cancers. FDA approval is likely a few years away. Angiograms may become much rarer, thanks to a new 23-gene blood test that checks for certain blood proteins linked to heart disease. In a recent trial, the blood test was 85 percent accurate in detecting potentially harmful blockages among patients. Added to other heart disease risk factors such as family history and chest pain, the test improved doctors' ability to categorize patients as being at high or low risk of heart woes in the future. "It's like radar in picking up what's going on in the blood cells," says lead researcher Eric Topol, M.D., director of the Scripps Translational Science Institute in La Jolla, California. The genetic test won't replace angiograms for several years. First, researchers need to show that it lowers the need for angiograms while not missing any dangerous blockages. That will require following a select group of patients — people the gene test categorized as low risk — to make sure they don't have any major cardiac events. But if successful, the test could significantly reduce the number of people who undergo the invasive procedure. You thought tattoos were just for punk rockers and Harley-Davidson fans? Think again. Heather Clark, Ph.D., associate professor of pharmaceutical sciences at Northeastern University in Boston, has developed a tattoo that can monitor your blood sugar without constant needle pricks — a huge advancement for the 26 million Americans with diabetes. 1. A tattoo made up of nanosensors — tiny polymer beads containing an orange-yellow dye — is applied to the skin, probably once a week. 2. Using a handheld device, diabetics scan the tattoo several times a day. The tattoo darkens when blood sugar is low and lights up when it is high, enabling the user to balance his or her glucose levels. The miniature tattoo — only a few millimeters in size — is made up of nanosensors: tiny polymer beads containing a yellow-orange dye that lights up when glucose levels are high and becomes darker as glucose levels drop. While traditional tattoos permanently stain the deeper layers of the skin, the diabetes tattoo is applied to more superficial skin layers, so its application is less painful and it wears off over time. "The plan is to have tattoos applied once a week," says Clark. 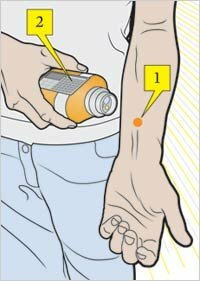 Patients will use a handheld device to scan the tattoo several times a day for color changes to guide their insulin use. Clark's team has tracked glucose levels in tattooed mice with diabetes, confirming these results with blood tests they took at the same time. If upcoming clinical trials in humans pan out, the tattoos could be on the market in a decade. The laboratory of Anthony Atala, M.D., looks like something out of a 1950s sci-fi movie. Human heart valves undulate in containers of filmy fluid. Bladder cells grow on baseball-shaped scaffolding. Strands of white muscle tissue contract in a lab dish. 1. Researchers build a biodegradable scaffolding shaped like the organ. 2. 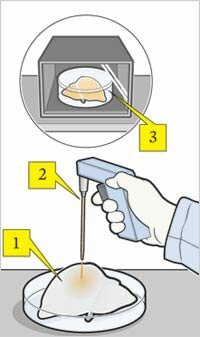 They then "seed" the scaffolding with cells from the patient (bladder cells for a bladder, liver cells for a liver, etc.). 3. The scaffolding is incubated and allowed to grow until the scaffold biodegrades and the organ can be transplanted into the patient. Atala's lab, the Wake Forest Institute for Regenerative Medicine, in Winston-Salem, North Carolina, was the first to build functioning organs from scratch — bladders that were reconstructed in nine children whose own organs did not function properly. In those cases researchers built a biodegradable scaffolding shaped like a bladder, seeded it with bladder and muscle cells from the patient, and implanted it into the child's body. One of the children — now a college junior — was in kidney failure when he got his new bladder 10 years ago. He went on to become captain of his high school wrestling team. The lab has since expanded its experiments to include more than 30 tissues and body parts. Last year the institute grew livers for the first time. Researchers washed ferret livers with a mild detergent to remove the animals' cells, leaving just the collagen matrix, then saturated the structures with human cells. Supplied with nutrients and oxygen in the lab's bioreactor, the 1-inch livers developed and appear to function like human livers. The work promises to improve the outlook for the nearly 120,000 Americans — more than half of whom are 50 or older — who need replacement organs and tissues. Every day about 18 people die waiting for a transplant. Growing the organs is a slow and painstaking process, and investigators also need to follow patients over time to confirm the organs' safety and durability. It will likely be a decade or more before these bioengineered organs are commonplace, but Atala is committed: "I've made it my mission to get this technology to patients." Beth Howard last wrote for AARP The Magazine about pain-fighting foods. You may also like: Beware of over-the-counter genetic tests.